Model:Mauser C96 (M1932 / M712 Schnellfeuer). Barrel: 5.5 inches, metal non-rifled. Ammunition Capacity: 19 round full size drop out metal magazine. 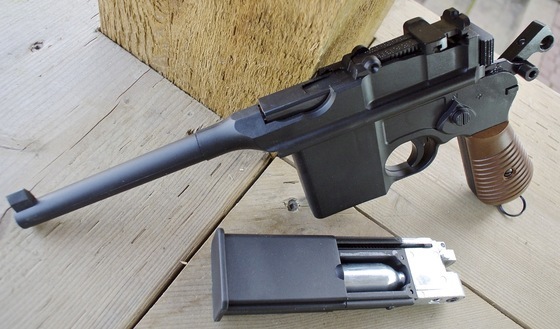 Trigger Pull: The trigger pull on the Umarex C96 Mauser Legends CO2 Blowback BB Pistol is nice and short with a medium weight trigger pull (around 5-6 pounds) allowing for very quick consecutive shots. Unlike the new Umarex Makarov Ultra and Beretta Mod. 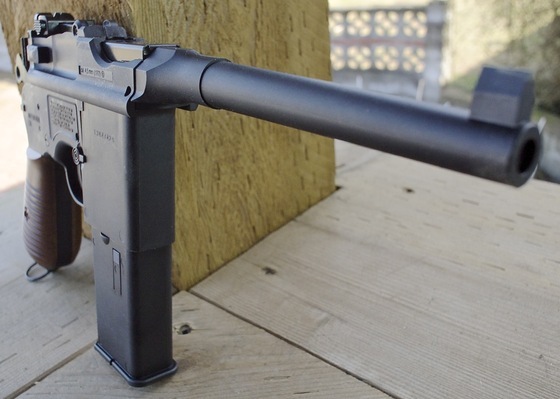 84 FS, the BB magazine chambering is done by the blowback action rather than the first part of the trigger pull which gives the Mauser C96 the best trigger by far out of all three guns. Accuracy: I tested the Umarex C96 Mauser Legends from 30 feet back shooting at a paper target using a semi rested position (sand bag up front and standing in the back). My 10 shot grouping was just slightly below the center bulls eye and a bit to the right, all 10 BB's stayed within 1.25 inches with most of them grouping closer to a 1 inch group. The Umarex C96 Mauser Legends also got a surprising 390 fps on this not very warm day which was 10 fps over the claimed Umarex Feet per second rating, I can see this CO2 BB pistol hitting over 400 fps on a warm summer day for sure! Build Quality: Lets get the fact that most of the outside of this CO2 BB pistol is plastic coated, I'm not sure why Umarex went this rout but it isa what it is and I do have to say the plastic looks great, not too glossy and not to flat, the quality seems very good and even though there is a lot of plastic on the outside there is plenty of metal used in the rest of this Replica Legends Umarex Pistol giving it a solid 2 pounds of mass in your hand. You will find it has a metal bolt, trigger, hammer, safety, rear sight, inner barrel and pretty much all of the full size drop out metal magazine which by the way holds the CO2 and the BB's. Fit and finish seems very good. Realism: The Umarex C96 Mauser Legends CO2 Blowback BB Pistol is not licensed but it still makes for a fantastic replica of a real steel Mauser C96 Broom-handle or should I say a M1932 / M712 Schnellfeuer which is the version that Umarex based their C96 on. I love all the working parts, the quick snappy blowback, short fast trigger, working safety, hammer and bolt, all combining to make this pistol a very believable Mauser replica pistol. Available in the:Canada Replica Airguns Store & US Replica Airguns Store. Good price for what you get, right now $110 in our Canada Store. Really good accuracy, power and CO2 usage combo. Decent weight and feel to it even though there is a lot of plastic on the outside. Full size dropout mostly metal magazine that holds the BB's and CO2. Adjustable rear sight for elevation. Really great trigger on it. Lots of plastic on the outside. Rear sight is not adjustable for windage, just elevation. 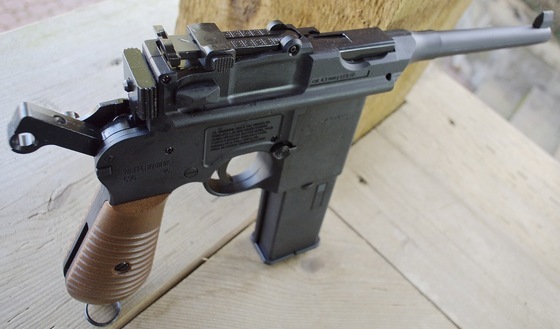 It's funny how earlier on Umarex came out with the Legends Luger P08 and even though it was pretty much an all metal air pistol, there where very few actual working parts on it, no blowback or even a bolt that functioned. Of course people complained about that, so what did Umarex do this time around... They switched things up completely and made a pretty much all external plastic air pistol but with tons of working parts and full functioning blowback action. 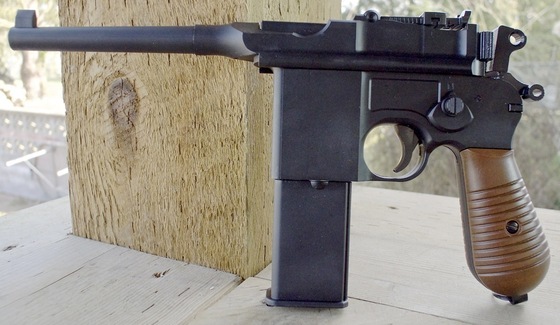 So of course Umarex has opened themselves up to more criticism for having too much plastic in the Mauser C96 ;) Even so, this pistol is one to consider picking up, ti really is a very well made CO2 BB pistol regardless of the plastic parts. It's a great replica with awesome blowback action and a super fast trigger, The fps for a blowback gun is on the high side, it shoots dead on and you even get 80+ shots per CO2 all in one of the most unique looking pistols ever made.